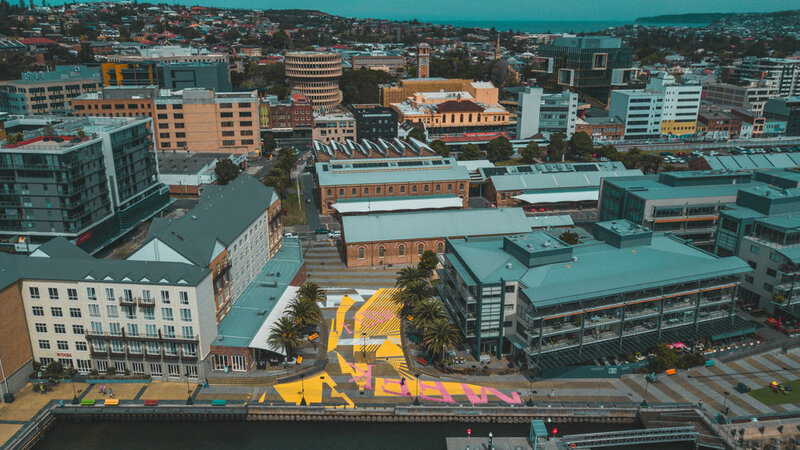 Honeysuckle Hopscotch is a painted-ground installation on the foreshore of Newcastle’s harbour. It is part of a larger ‘place-making’ research project, sponsored by the NSW State Government on understanding and improving engagement and habitability of public space. Its title, Honeysuckle Hopscotch, is nostalgic for a game, a playful activity temporally occupying a place, if not in a sometimes, awkward and abstract manner. The painted ground project intends to address the Albedo Effect (light and heat reflected off of surfaces) through an exploration of colour, vibrancy and history on a desolate and vacant surface. The paint becomes a medium to renew use and appeal and establish a connection between the public and place. Research was undertaken by the Newcastle School of Architecture and Built Environment (SABE) on thermal comfort and the site was identified as a ‘hotspot’ where radiant heat and the lack of shade cover limit use patterns. This contributes to a growing problem in Newcastle around issues of Urban Heat Island Effect (UHIE) and climate change adaptation. To address this, the installation identified colours of paint with a high Light Reflectance Value (LRV) in an attempt to reduce radiant heat. The selection of white, yellow and pink as the primary colours, would help to reflect the heat, and improve the micro-climate in this vast expanse of pavement. Additionally, the clarity of colour provides a resounding contrast and vibrancy to the public space and its surroundings. The site resides between a multi-storey apartment building and Rydges Hotel. It is an important urban junction, connecting the pedestrians of the harbour promenade with an inland axis to Newcastle's civic centre. The ground is currently a weathered concrete surface that formed part of the 1990's Honeysuckle Redevelopment, post-earthquake Newcastle. The site is open to the elements, and is exposed to both wind and sun, with no shade from significant shelters or planting. The latter is due in part to the fact that this area of land has been reclaimed from the Hunter River, and throughout recent history has continually transformed over the course of industrial settlement. Prior to this, the site was recognised as Honeysuckle Point and was an important cultural location for Aboriginal inhabitants. Marking the intersection of Throsby Creek and the Hunter River, Honeysuckle Point was formed through natural sedimentation of the tides and the low-lying mangroves and "Honeysuckle Plants" that dotted its southern shore. Aboriginal inhabitants referred to Honeysuckle as Meekarlba (Honeysuckle: Plenty of Honey). Referring to Banksia Integrifolia and Banksia Serrata or White and Red Honeysuckle, and the nectar was collected from the trees when Indigenous life thrived in the area. The river estuary was the site of hunting, fishing and resting around a campfire on the shores of the harbour. Here, shellfish were harvested for thousands of years and their discarded shells were piled into enormous middens. These were later burned by Europeans to produce lime for building purposes. The economic revitalisation of international trade created quite a new and distinct landscape, and in doing so, another landscape was destroyed. The new portside activity dominated the area having an extreme impact on the natural formation and geology of the shore. Dredging began in the mid 1800’s using ladder dredges to remove mud, sand, boulders and surface rock and the spoil was used to reclaim new water frontage.This newly formed shore became an industrious waterfront of trains loading coal onto ships. Today, only remnants can be seen of the rail lines that used to carry goods to and from the wharves. And the majority of buildings that housed the industry, including small berths and sheds that accommodated official craft, including Water Police, Customs, Fisheries and RAAF Air Sea Rescue Service are mostly demolished. 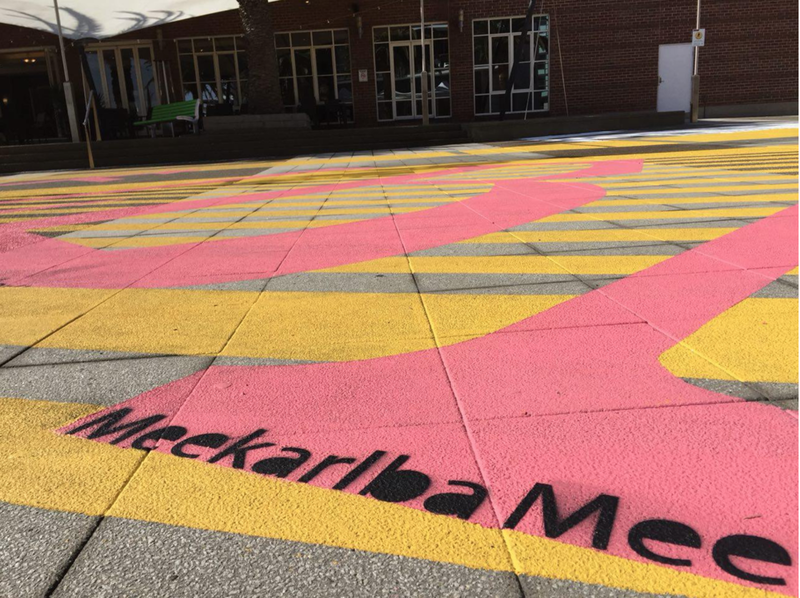 The artwork traces these distant histories in abstract graphic language resembling changes in the edge of the water line over time, ghosted building footprints, and most importantly the Indigenous name for this area, Meekarlba is inscribed in bright pink as a reassertion of country and an acknowledgement of Aboriginal people's dispossession. The artwork becomes a composition of periods in time and occupation; resonating a Hopscotch. The design process was derived from the historical contextual layering of the site, resonating with the physical processes of sedimentation, middens and dredging juxtaposed with the coating process of paint. As such, the maps were imported into the computer and layered upon one another to form a single 2D graphic. The compression of the maps into a single image forces an error in the perception for both the observer and computer. Confused by the intersecting graphics, fragments of each map are simultaneously cancelled out and revealed in part. The original information can therefore only be recognised in part, withholding one’s ability to perceive each individual map as a whole. For the observer, these fragments are a catalyst for further inquisition and interpretation of the work. Accompanying text provides a clue to the origins of information including dates for changing shorelines, pre-existing infrastructure and occupation. The users can walk across and read complex layers of cultural information in the midst of the mapped surface. This is a palimpsest approach to placemaking, where time, site, and meaning is layered, partially peeled back and obscured as an incomplete and always emergent history unfolding in space and across time. At times however, the graphic is completely unrecognisable and is lost in the compressed traces of history. These moments of confusion promote indeterminacy, free of narrative or purpose. For example, the white lines throughout the work draws an uncannily reference to the bore-hole diagrams that were drawn as part of the geotechnical exploration in the local area. Revealing the sedimentation of rock, coal, silt in varying thickness of black lines as they were deposited in time. It is this freedom in the graphic that provokes a dialogue between observer and graphic. It allows one to interpret meaning and/or activity bringing movement/pause and play/games to the public space. This has the potential to be experienced at both a personal (immediate) and large scale (as seen from above). So much so, that the provocation of the work sparked comment in the local newspaper as to the lucidity of the artwork. The installation of the work by Architecture students from Newcastle University was also an intriguing provocation of boundary and connection in public space. The temporal occupation of zones to install the artwork over ten days further promoted an ongoing sense of inquisition by the public. This curiosity was met by the eagerness and ownership held by the students. Such dialogue around the insertion of the work demonstrates that the pre-existing condition failed to promote any interaction as well as a sense of belonging. This place-making process will allow the painted ground to renew and evolve over the proposed period of time. By addressing the scale, application and patterns of use, Honeysuckle Hopscotch ensures an ongoing interest in the art work, and subsequently, the public space within the community. Luca Hudson, Sina Saghari Khodaparast, Golshid Hor, Laura McDonald, Kate Morris, Miranda Cunningham, Mohabatpal Singh, Muhammad Nazif BinAbdulHalim, Alyssa Thomas, AhmadSeiar Ahmadiar, Bonanta Adity, Oliver Hubbard and Ropafadzo Mhazo.